wargame sur La Guerre de 7 ans couvrant les théatres européens et d'outre mer. Between 1756 and 1763, Europe erupted into what became the first true world-wide conflict, known as the Seven Years' War. On the one hand, Britain and France vied for supremacy in world-wide trade, becoming deadly enemies in the process. On the other, Austria and Prussia struggled for dominance in Germany. On the fringes, Russia began to feel her growing power, while Spain, the Netherlands and Turkey all knew their time was almost up. 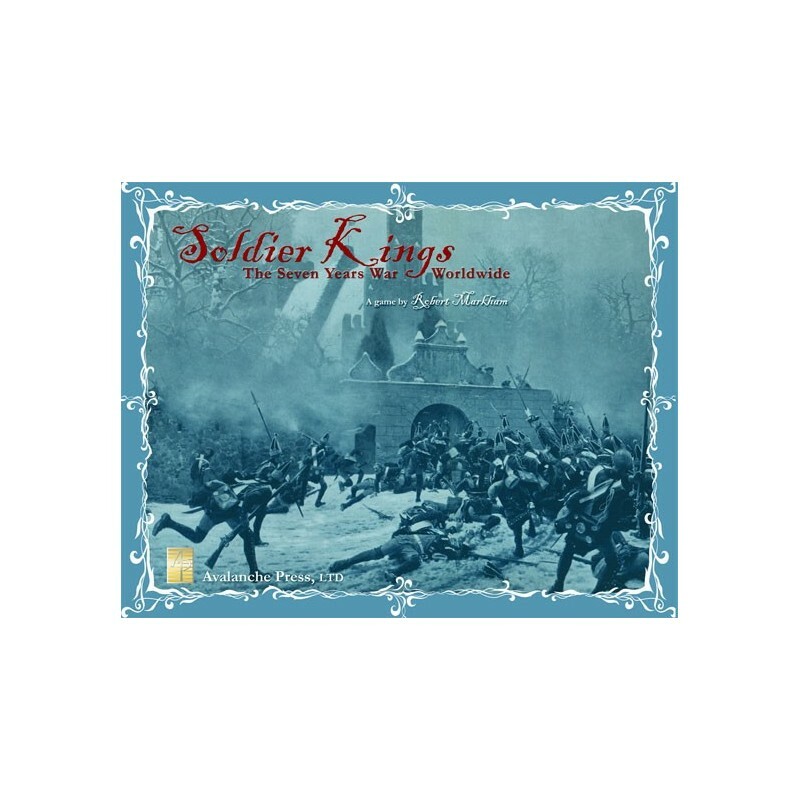 Soldier Kings re-creates the free-for-all that was the Seven Years' War. 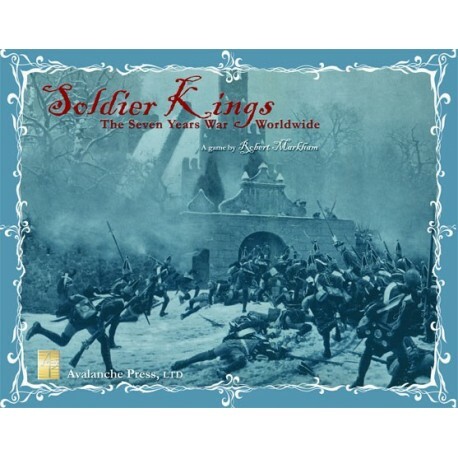 Two to eight players take the roles of the nations listed above, trying to capture or hold onto the rich lands of Europe, India, South-East Asia and America. The world is changing; the power that grabs the most now will dominate the modern age that is just dawning. If you're the Soldier King, that power will be you. 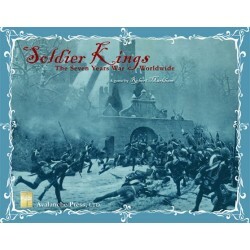 In Soldier Kings, each player has armies and fleets. There are also a handful of generals and admirals to assist these in battle and in movement. The best is Frederick of Prussia, called "The Great" for a reason. The worst is the hapless Prince of Orange, with whom the Dutch player is saddled. Players have allies; some are set at the beginning of the game, others alliances are forged during the course of play. Everyone else is an enemy. No one is "neutral"; those are just enemies you haven't attacked yet. 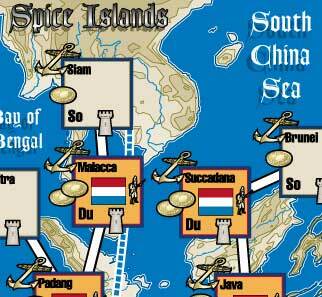 The map is divided into land areas and sea zones. Armies move on land, fleets at sea. Each land area is rated for the amount of money and manpower it generates each turn. Manpower represents not just fresh recruits for your forces, but also the things made with human labor: food, uniforms, weapons and so on. Money is, well, money. You expend manpower to rebuild your forces, and money to finance their actions. Thus you need to hang on to areas that generate these resources for you, and take them from the other guy. You do that by defeating enemy armies, and besieging enemy areas. Combat is conducted by rolling dice, one for each attack factor. These hits must be sustained by enemy armies by reducing them in strength, or eliminating them. A good general lets you roll more dice. Each area is rated for its garrison strength; to capture it, you have to defeat the garrison troops through siege (in addition to driving off any enemy armies there). The procedure here is very similar. Throwing a twist into all of this is card play. The universe is loaded with random elements; life does not unfold as an orderly series of "phases." After a short countdown to start the game, players can play cards at any time, in any order. The cards are the centerpiece of the game, giving it its free-wheeling nature. Generals can vacillate. Mercenaries can be hired. Local militia can appear to help. Soldiers might run off to loot. Bridges get burned, snow falls early, the harvests are bad, the harvests are good. Royal marriages, minor country alliances, the rise of new leaders - all sorts of events take place during card play. The game contains seven scenarios: a campaign game covering the entire war, and then six shorter ones, one for each year of the war. Play ends on a pre-determined turn or when a player has achieved his or her conditions for automatic victory, whichever comes first.